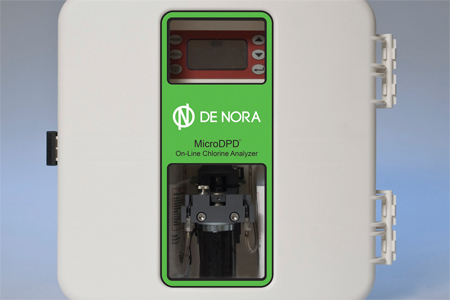 The MicroDPD® analyzer uses proven DPD colorimetric technology for monitoring chlorine in both municipal and industrial applications. The instrument can measure free or total chlorine in drinking water, wastewater and seawater. The MicroDPD has many superior features over competitive instruments. The 0-10ppm range allows for diverse applications. When above 10 ppm, the display will flash indicating an out of accurate range condition but it will continue to trend up to 20ppm. The measurement signal is forwarded to a monitoring device using either the 4-20 mA output or RS485 Modbus communication. Cycle time is not fixed – it is user selectable from 110 to 600 seconds offering greater control over testing conditions. The removable sample cuvette is designed to create a vortex which allows for thorough mixing of reagents and thorough purging of waste to eliminate cross contamination. Water and reagent flow through the instrument are microprocessor controlled. The instrument will accept sample water between 5 and 150 psig through a factory set pressure reducing valve. The MicroDPD is shipped fully calibrated with all parameters factory preset. Set up and plumbing are simple -- sample tubing is inserted into a ¼" quick connect fitting. Insert reagent bottles and power to the instrument and it is ready to analyze your process steam.